India vs Sri Lanka 3rd ODI: Shreyas Iyer joined Shikhar Dhawan in the middle and the two stepped on the gas to ensure Sri Lanka has no chance of scripting any comeback. Iyer outpaced Dhawan and scored a fine 65, though he would be disappointed as he had a great chance to remain unbeaten or even score a maiden ton. Perera accounted for him as he mishit one straight to Lakmal at mid on. 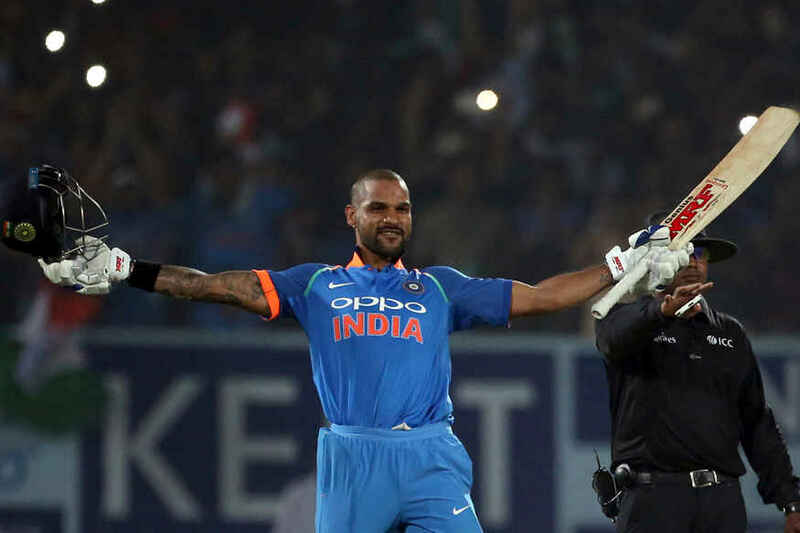 However, the experienced Shikhar Dhawan made the most of the opportunity and completed his 12th ODI ton in dominating style. He wasn’t troubled even once and remained unbeaten on 100, scoring 13 boundaries and 1 maximum. Dinesh Karthik too remained unbeaten on 26. Earlier, winning the toss and electing to field first, it didn’t go according to plan for the hosts as Sri Lankan openers came out all guns blazing with Upul Tharanga doing the maximum damage. He smashed 5 consecutive boundaries of Hardik Pandya’s over as Sri Lanka looked set for a big total. Sadeera Samarawickrama provided the supporting role and it seemed that the Islanders might well post a score above 300 – which was required on the pitch. India decided to bring in Kuldeep Yadav in place of ill Washington Sundar and Rohit decided to introduce the wrist spinner in the 11th over. Kuldeep and Chahal then hunted in pairs and Sri Lanka had no answers to the Indian spin duo. First to depart was Samarawickrama, who tried to go after Chahal but ended up finding Dhawan, who completed a simple catch. MS Dhoni’s quick work behind the stumps meant that Tharanga – who looked set for a ton – had to make his way back to the pavilion for 95. After that, the Indian spinners completely dominated as Sri Lanka collapsed from 160/2 to 215 all-out. Some ordinary shots along with some fine bowling led to Sri Lanka’s downfall. The spinners shared six wickets between them as Kuldeep ended with figures of 3/42 and Chahal with 3/46. Dickwella ended up giving catching practice to Shreyas Iyer at first slip. Mathews got an absolute peach from Chahal to which he had no answer and had to make his way back to the dressing room for 17. Pandya (2/49), Bumrah (1/39) and Bhuvneshwar (1/35) also chipped in with the wickets. Now, the action moves to Cuttack, where India will play the first T20I against Sri Lanka on Wednesday. Previous articleGujarat and Himachal Pradesh Election Results Tomorrow, Will BJP Prove Exit Polls Right?